Welcome to the village of Chartres. 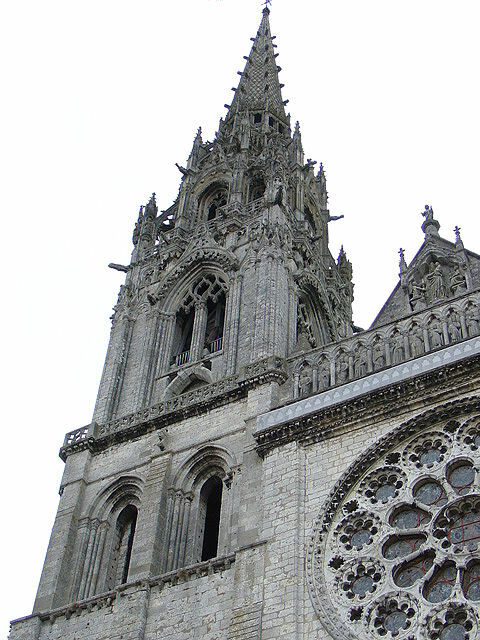 This shot is of the North Tower of the Chartres Cathedral. 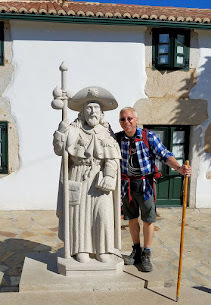 All photos property of EuroTravelogue™ unless specifically noted. Please do not use without permission. While my anticipation to visit Paris was running at its highest, it’s ironic that once we arrived via our overnight train adventure, we left the city just as quickly on a half-day guided tour to the French-provincial village of Chartres. As it turned out, this jaunt to the French countryside turned out to be one of the highlights of my vacation in France. After touring in Italy and reveling in every encounter with Renaissance art and architecture, I couldn’t wait to explore my first French Gothic cathedral—Notre Dame de Chartres. Won’t you join me on this guided tour? Located about 90 kilometers or 60 miles southwest of Paris, the village of Chartres is steeped in history and its main attraction—Notre Dame de Chartres, the village’s medieval cathedral dominating its skyline and seen from just about every vantage point throughout the town. Even more impressive is your first glimpse of the cathedral upon approach from the major roadways. Suddenly, this colossal edifice looms on the horizon in stark contrast to the blue skies, and foreshadowing all that surrounds her. 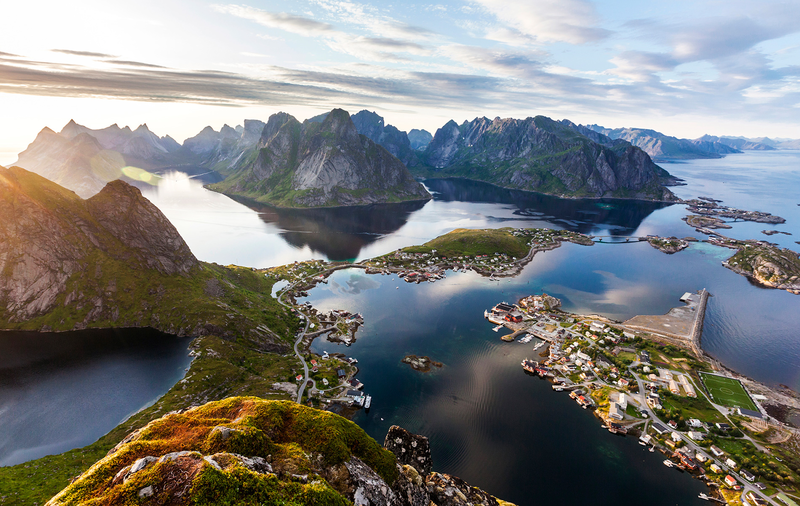 Truly, it is a spectacular sight filling you with anticipation and excitement as the village draws near. Whether you’re religious or not, historians, scholars and journalists alike, not to mention the tourists, will rejoice in their visit to this unforgettable cathedral. Shops of every kind line the quaint streets of the provincial village of Chartres. Renowned mostly for its distinctive bell towers, its architectural splendor and its radiant stained-glass windows, Notre Dame de Chartres or Our Lady of Chartres is actually the fourth cathedral to stand on this site and is one of Europe’s most revered because of its state of preservation since consecration in 1260. Moreover, artifacts from its predecessors, dating back to the 4th century, remain today due to the various reconstruction periods when newer cathedrals were rebuilt on top of earlier ones, thus preserving forever, subterranean troves of ancient treasures and crypts. It’s no wonder UNESCO added this magnificent edifice to its list of World Heritage Sites in 1979. The Holy Relic of Chartres-fragment from the Veil of the Holy Virgin. One of the cathedral’s defining moments occurred during the third reconstruction period in the 9th century when Charles-le-Chauve (Charles the Bald) presented Biship Gislebert with a relic of the Holy Virgin’s veil, thus solidifying this site as a place of religious pilgrimage for Europe of the day, and for the rest of us today! Actually, Chartres owes its existence to the survival of this relic after the fire in 1194 destroyed most of cathedral save the facade, towers and crypts. Whether it was gold, building materials or the power of prayer, Christians from all walks of life set out to bring what they could to restore the Holy Virgin’s cathedral for they believed the survival of the relic was a sign from Holy Mary. You can see the veil enclosed in its glass case in the Mary Chapel located in the left apse behind the high altar. 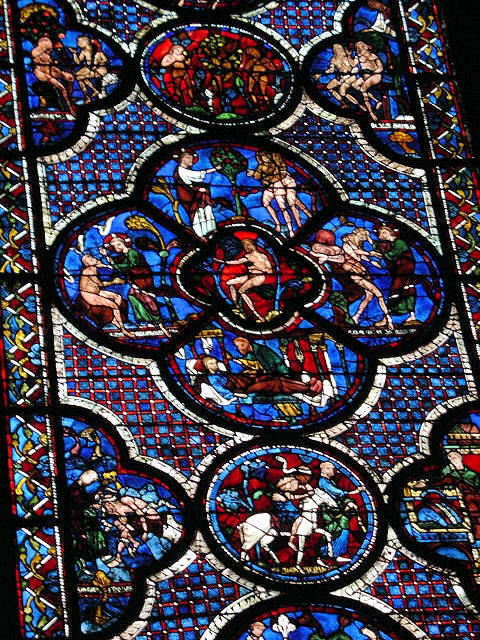 Behold the splendor of Chartres' stained-glass windows! Magnificent tapestries of colorful light recount numerous stories from the Bible. Among its many highlights, the cathedral’s 12th- and 13th-century stained-glass windows certainly impress as they bathe the cavernous interior is a most glorious light. Recounting stories from both the Old and New Testaments of the Bible, the windows are exquisite down to the finest detail and you could spend hours reading every panel from left to right beginning at the bottom. Most notable are the three Rose windows over the portals: West Rose depicts the “Last Judgment;” the South Rose tells of the second coming of the Lord; and the North Rose glorifies the Virgin Mary in the middle with the Christ Child on her knee, surrounded by the Kings of Judah and the Prophets. In addition, don’t miss the brilliant 12th-century Blue Virgin window located on the southern facade. 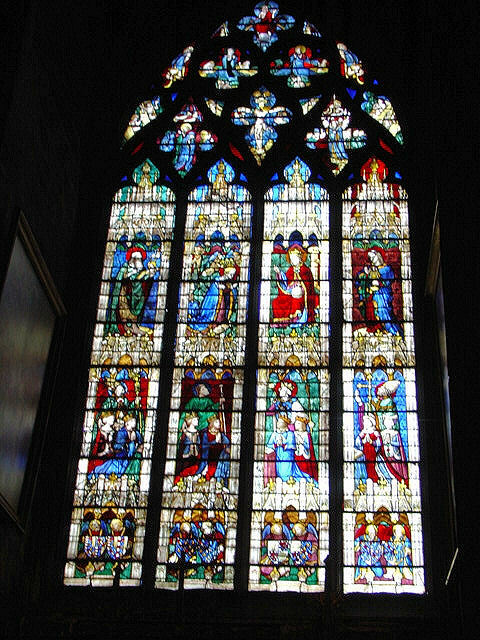 The North Rose Window shows the Virgin Mary with Christ in the center, the five lancets below show Melchizedect and Nebuchadnezzar, David and Saul, St. Anne holding Mary, Salomon and Jeroboam and finally Aaron and Pharoah. Close-up view of the "Parable of the Good Samaritan." Head to the center of the nave and look for the 964-foot-long or 300-meter-long labyrinth set in black stone retracing the path from humanity to God. Laid in 1205, the labyrinth has attracted pilgrims throughout history who come to retrace its path to eternal glory. 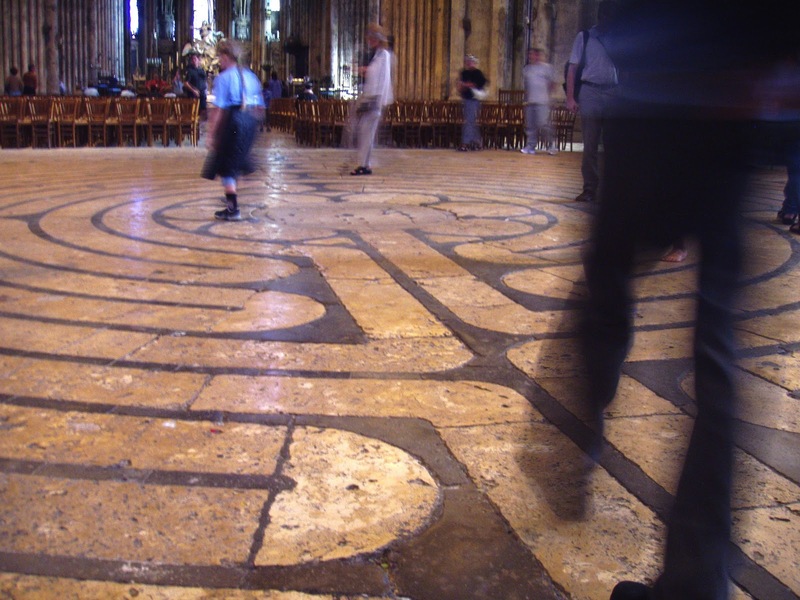 This labyrinth is actually featured in one of my favorite books by Kate Mosse entitled "The Labyrinth" (affiliate link) which takes place in Chartres and surrounding areas of France. A must-read fascinating story that takes place in two centuries simultaneously. Chartres Labyrinth. THIS PHOTO ONLY: Daderot via Wikimedia.com. Moving toward the altar, don’t miss the exquisite sculptural detail of the Choir by Boudin in 1612 with scenes of Christ’s Baptism, the Lord’s Temptation, birth of Christ, among many others and too numerous to list here. 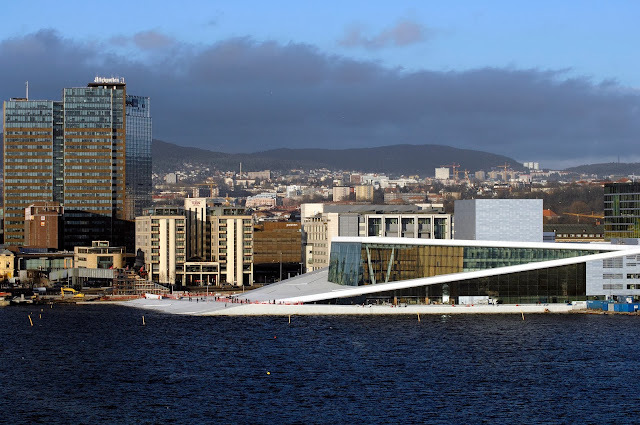 For an awesome 360-virtual tour visit 360cities.net. Close-up detail of the Choir screen showing scene from the Passion. Even more impressive than its interior, is the Chartres cathedral’s exterior, the blending of architectural elements due to the many reconstruction periods. This is most evident in the two soaring albeit disparate bell towers flanking the facade—the result of the cathedral’s battle to survive its plagued history of destruction and rebuilding. The tower on the left was begun in 1134 but not crowned with its spire until the 16th century. The southern tower on the right was begun in 1145 but its Romanesque design remains as testament to an earlier time. Two distinctive bell towers soar above the village of Chartres. Also, be sure to see the western, northern and southern portals and the exquisite sculptures depicting a diverse range of subject matter from pagan symbols of the zodiac to scenes from the Old and New Testaments. As you make your way around each of the portals, I strongly suggest you have a book or a tour guide who will explain the historical significance of what you’re seeing. I have captured a few shots of the stunning detail of these fascinating and magnificent sculptures! Full view of the Royal Portal on the western facade from Rose window at top to the magnificently ornate doorways. 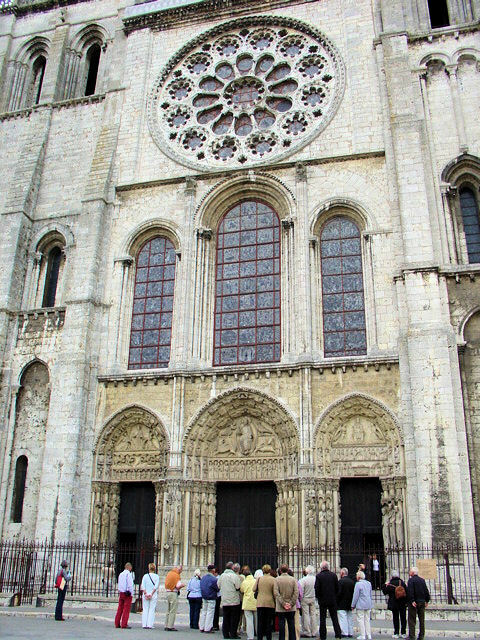 Chartres Royal Portal Entrance - Western Facade. Exterior Royal Portal Tympanum showing Christ surrounded by symbols of four evangelists and 12 Apostles below. Royal Portal close-up view of the right-pillar detail. Close-up view of zodiac sculpture found on Royal Portal doorway. 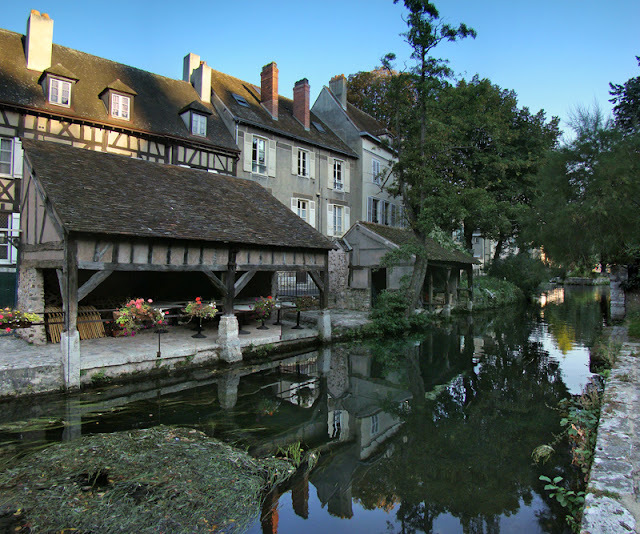 Certainly, you could spend an entire day scrutinizing and examining all of the architectural detail of the Chartres Cathedral and I suggest you do but for us, time was short and we wanted to see some of this picturesque village in the little time remaining. As we wandered throughout its quaint streets lined with French architecture and storybook half-timbered houses, you couldn’t help but feel the pages of a fairy tale coming to life. Also of course, we had to sample some of the delicacies and so we set out to visit the boulangerie and the fromagerie for a baguette stuffed with cheese, and indulged in this tasty treat before we boarded our bus back to Paris. Now you’re probably wondering about the proverbial wine with my baguette? Unfortunately, we ran out of time. Quaint and charming vine-covered house, one of many fairy tale images brought to life in Chartres. One of many picturesque scenes throughout the village. This is a shot of the River Eure in Chartres. THIS PHOTO ONLY: Tango7174 via Wikimedia. With so much to discover in Chartres, I urge you to tour this magnificent cathedral and town with a guide to make the most of your visit. Be sure to include Chartres on your next holiday in France. By Train: Trains run quite often from Gare Montparnasse and the journey takes little more than an hour. It’s a great way to see the French countryside. Visit Rail Europe (affiliate link) for more information. By Car: Take the A10 to the A11 approximately 93 kilometers or 57 miles. Or for a more scenic route, take the RN10 or N10 approximately 64 miles. Group Tours: Available at many of the local tourist offices throughout Paris. Or, check out City-Discovery.com for more information about their half-day tour to Chartres. Most of our guests at Chateau de La Barre stop off at Chartres on the way here and really enjoy renowned scholar, Malcolm Miller's tour, from Spring to November daily at 12 and 14h45. Thank you so much for the information on Malcolm Miller's tour of Chartres. I bet it's fascinating. All visitors can click on the Chartres Tourism link above and search for the Malcolm Miller Tour, highly recommended by Trip Advisor, Fodors, Travel + Leisure and more! Thanks Marnie for stopping by and sharing the insightful information. As usual your pictures are extrodinary and with such beautiful detail. I enjoyed my visit to Chartres and walking down the quaint streets through your eyes. GREAT JOB keep up the EXCELLENT WORK. KEEP UP THE BRILLIANT WORK. I really love reading your articles. THANKS AGAIN. Dear Anonymous, I have been wondering where you've been. Thanks so much for stopping by once again and for your kind words. Nice to see you again!! Wow is that the infamous Notre Dame? Such a cool tour. I love taking photos and learning history just like you. Love the lastt shot with the water, so zen like too. It's Notre Dame but not the cathedral in Paris, this one is Notre Dame de Chartres as opposed to Notre Dame de Paris. Both are quite extraordinary I agree and I too love that last photo...so peaceful and enchanting! Thank you for stopping by to share your thoughts. Hi Jeff, your photos are so great!! If you love night photography I recommend you to visit Chartres during the light show usually on April to September. Some monuments and principal buildings including the cathedral will be beautifully illuminated. Hi there Feily...and thank you so much for the advice for me and my readers, not to mention your kind words and compliments. I truly appreciate you stopping by to share. 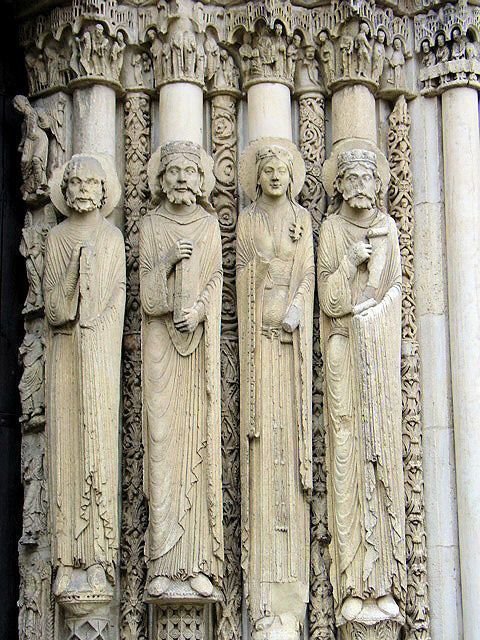 I briefly stopped by the Chartres Cathedral in May 2010. I must add one thing that I love the most about my visit : I thought they were cleaning up the cathedral! ( i hope i didn't mistaken rebuilt for cleaning up) and I could actually see the details clearly on the ceiling. Couldn't agree with you more about the Chartres experience. And thank you for stopping by and posting your beautiful photograph. Not sure if restoration efforts were underway during your visit but it sure looks stunning. Thank you again. Jeff, Love the photos! You have a wonderful way of bringing items to life. The photos of the stained glass are phenomenal and one of my favorite parts of any cathedral... I would often sit in church and watch the colored lights playing on the floor! Hi Leslyn and thank you once again for visiting and sharing your comments. I love cathedrals...have you seen Sainte Chapelle in Paris? I must see if you love stained glass windows...it doesn't get better! Beautiful, Jeff. I just love churches, and this one is so very special. Great job. I couldn't agree with you more!! One of my must-dos on all of my travels is to see the cathedrals and churches. They are truly fascinating!! Thank you so much for stopping by and for your kind words! great tour, we are trying to think of day trips from our stay in Paris this summer. This may be a great idea for us! Hi there Lisa and thanks so much for stopping by! Not only this tour but you should think about a full-day tour to the Loire Valley as well!